Poor surface conditions and high traffic loads on a section of the E18 between Langåker and Bommestad led to serious congestion. It became apparent that the bottleneck needed to be relieved with the construction of a new four lane, 8.1km long highway. Nynas' polymer modified binders, with the collective name Nypol, are produced from specially selected bitumen, primarily in combination with SBS polymers.. Regional road authorities in Norway have established a new strategy whereby highly trafficked roads should be paved with asphalt containing Polymer Modified Bitumen (PMB) to increase the lifetime of the pavement. The new strategy was inspired by work previously carried out on the E18 (further north of the old bottleneck). It was evident here that despite the initial higher cost, there was a significant increase in the lifetime of asphalt where PMB was specified, leading to better overall value. For the recent contract on the E18, Nypol 73 was chosen as the preferred PMB. Improved performance of the Polymer Modified Binder had to be documented by the contractor before the road authorities would allow it to be used. The contractor carried out wheel tracking tests to compare Nypol 73 with a standard 70/100 bitumen, the higher grade binder also had to demonstrate very good wearing properties using the Prall method. This test measures a value corresponding to the mass of the asphalt worn from the test specimen during the test. 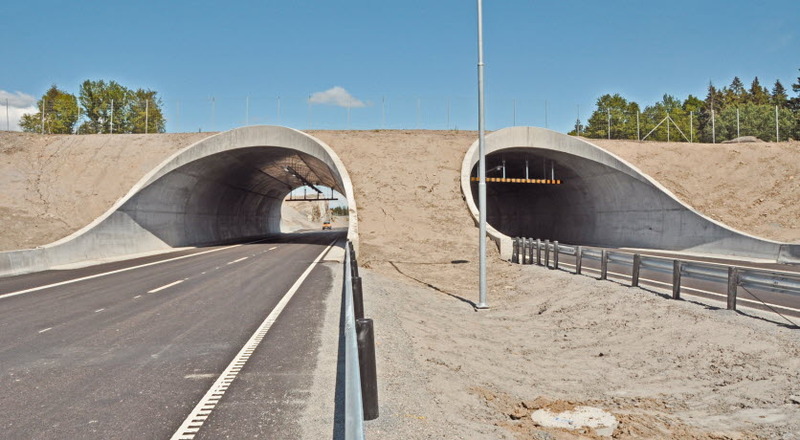 Skanska Norge AS was awarded the contract to build the new road and Skanska Asfalt AS was appointed as subcontractor to lay the asphalt pavement. A mobile asphalt plant was set up on site and Skanska chose Nypol 73 based on its good track record in both Norway and Sweden. Construction of the road presented significant challenges, with contractors having to work to very tight timeframes and make use of recycled materials. Another major factor that had to be considered was the logistics behind the supply of Nypol 73 over a long distance from Sweden, in an ever changing weather climate. Construction of the four lane, 29m wide highway was completed two months early and pleased not only the contractors and the road’s owner, but also residents who live beside the old road. No doubt motorists in general are happy with the new highway as well, not least because some would have suffered delays in the area for the last 20 years. Download this information on how Nypol 73 was used at E18 Langaker - Bommestad, Norway, as pdf.